Governance discourse centers on an "ideal type" of modern statehood that exhibits full internal and external sovereignty and a legitimate monopoly on the use of force. Yet modern statehood is an anomaly, both historically and within the contemporary international system, while the condition of "limited statehood," wherein countries lack the capacity to implement central decisions and monopolize force, is the norm. 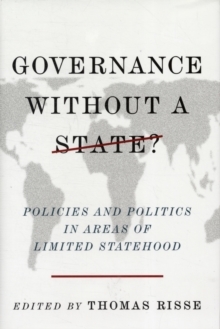 Limited statehood, argue the authors in this provocative collection, is in fact a fundamental form of governance, immune to the forces of economic and political modernization. Challenging common assumptions about sovereign states and the evolution of modern statehood, particularly the dominant paradigms supported by international relations theorists, development agencies, and international organizations, this volume explores strategies for effective and legitimate governance within a framework of weak and ineffective state institutions. Approaching the problem from the perspectives of political science, history, and law, contributors explore the factors that contribute to successful governance under conditions of limited statehood. These include the involvement of nonstate actors and nonhierarchical modes of political influence. Empirical chapters analyze security governance by nonstate actors, the contribution of public-private partnerships to promote the United Nations Millennium Goals, the role of business in environmental governance, and the problems of Western state-building efforts, among other issues. Recognizing these forms of governance as legitimate, the contributors clarify the complexities of a system the developed world must negotiate in the coming century.